A call to the pizza-loving nation! Mark your calendars on August 15, 2013 as California Pizza Kitchen opens all their 10 branches in celebrating the annual National Pizza Day. 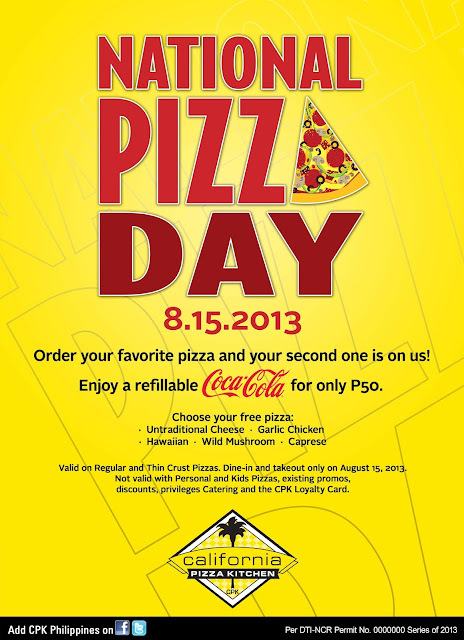 Since last year, the restaurant has started commemorating by giving away free pizza with every pizza order. The one-day event has drawn up lines of diners outside each restaurant. In lieu of this event, they have added five more pizza varieties. 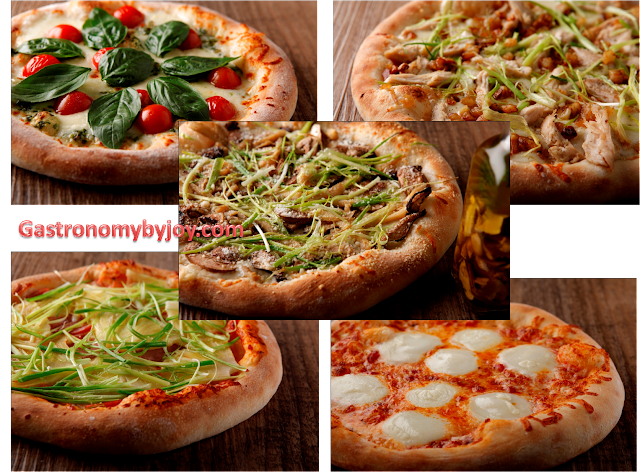 Choose from Caprese, Garlic Chicken, Wild Mushroom, Hawaiian, & Untraditional Cheese and get your next pizza, for FREEE! Incorporating tradition and heritage into the pizza making process, creates what are arguably some of the better pizzas. At the opening of CPK’s tenth restaurant which is at the ground floor of Eastwood Mall, the people operating for GRC Inc, have stressed out that CPK has remained true to its DNA in serving the best pizzas which are traditionally prepared and also with other menu items which have passed through some in-depth research, which mainly focused on what the clients want. Global Restaurant Concepts Inc. (GRC) unveiled its first restaurant concept with California Pizza Kitchen (CPK) in the Philippines in 1997. It was the first international franchise to be granted by the US pizza chain. Sixteen years and ten branches later, CPK continues to dominate the premium pizza restaurant experience by opening two more outlets before the year ends. GRC President and CEO Archie Rodriguez, who has been there since the restaurant’s local entry, recalled that it took awhile for the US pizza company to warm up to the idea of an international branch. “Convincing the founders that the Philippine market was prime took over three years, but we stayed focused and true to our commitment to sign the brand. It took time, but we believed in investing in our people and country,” he said. 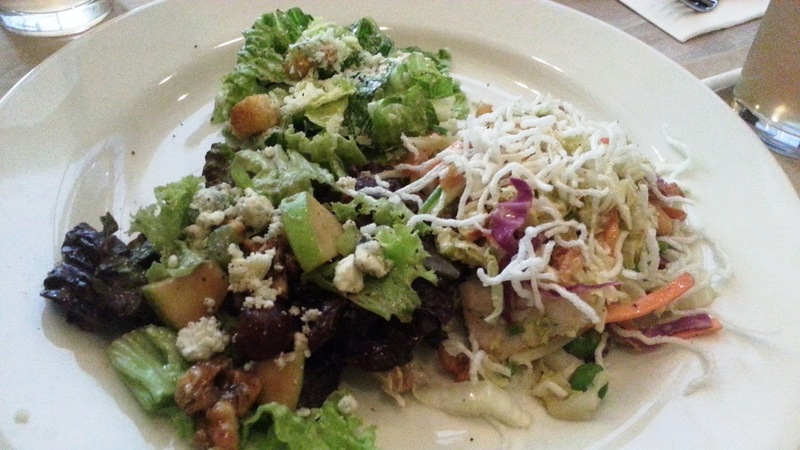 Local and big international restaurant brands had been operating longer when CPK arrived. Among pizza restaurants then, there were a few brands that catered mostly to the mass market. “There was no family restaurant that offered unique premium pizzas and a variety of dishes inspired by global flavors. CPK was all about innovation and it was this creativity and commitment to quality that really made us stand out in the crowd,” Rodriguez said. As Manuel Zubiri, GRC Vice President and Purchasing and Facilities Management Director added, "as you can see, the new stores have maintained the menu, what the oldies like, also, while in a way to reach out to the younger generations by creating pizza varieties that would suit their taste. This stand true as we have brought back the vintage pizzas. With this minor changes, we also needed to reinvent the look of the stores." With the new stores like the ones at The Fort and at the newest branch in Eastwood, they have taken out the black colors and maintained the vibrant yellow tones. Making the dining venues lighter to look at and thus more comfortable. CPK refers to it as their “pizza authority,” a claim now backed by 16 years in the Filipino palate, an expanding branch network and an ever evolving menu of gourmet pizzas, pasta dishes, sandwiches, salads, desserts and appetizers. It is also among the few non-Italian pizza restaurants that offer a wide variety of wine and beverages. For their first restaurant outside Metro Manila, CPK opened in Harbor Point Mall in Subic last year. The company has received calls to open outside Metro Manila, but visibility and accessibility is regarded highly in location choices. “I must admit that when we look at markets outside the metro, we are a little more careful. Each location needs careful planning and study. But with the right partner and the right location, we are confident we can do well,” Rodriguez added. By the fourth quarter, CPK’s 11th restaurant will be located in SM Mall of Asia. Even with the rise of both home grown and foreign pizza brands, Rodriguez remains upbeat about CPK’s growth in the country. After convincing US principals of the Philippines’ market potential and building a 16-year old restaurant brand, Rodriguez has learned a great deal from CPK’s continuing story. 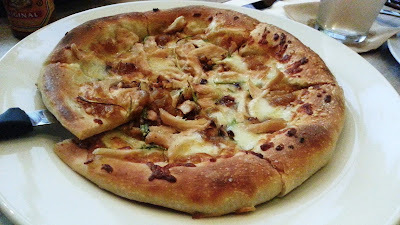 Do you want to know how the five new pizza tickled my palate (and filled my tummy)? After a trencher of three different salads in one plate, I started hashing on the different pizzas that was made for us to try on the opening of Eastwood branch. The first to be served was Garlic Chicken. If you love garlic and know it's health benefits, then this is your pizza. A considerable helpings of roasted garlic, grilled chicken, caramelized onions and slivered scallions all woven together with not one kind of cheese but two, Mozarella and Parmesan. My favorite among the five is this - Caprese. Why? Because it has pesto. This may look like a simply pizza pie topped with summer veggies resembling Bruschetta. 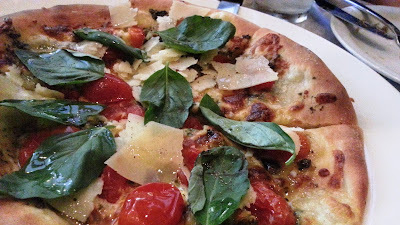 Simply vision it this way, your crust, made the traditional way, topped with basil cashew pesto, whole juicy cherry tomatoes, Mozarella and fresh Mozarella (Oh yes, there is a difference) and fresh basil leaves. Oh before I forget, thinly sliced Grana Padano Parmesan were substantially scattered. 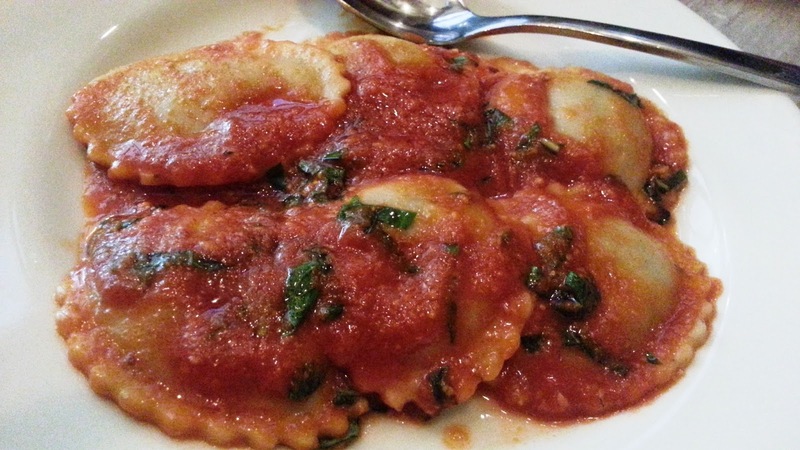 So how can you get more Italian than that? 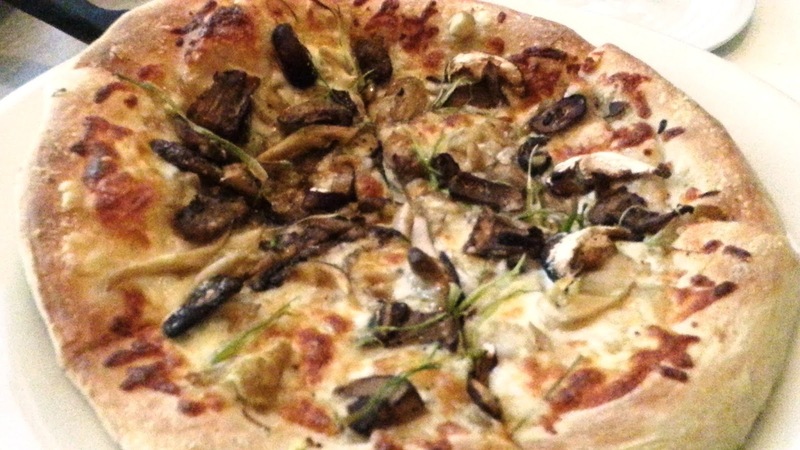 If you are into mushrooms, or is just so absorbed with the different types of mushrooms, or a mycologist who is into the study of it, then you'd definitely be interested on this pizza- Wild Mushroom. Shitake, Abalone and white mushrooms are sliced and morphed with Mozarella, Romano and Parmesan. The savoriness fueled with garlic olive oil and slivered scallions and heightened it more with mushroom olive oil. However, the wait staff will ask you whether you want to have it drizzled with mushroom olive oil, a 15-days infusion of mushroom and olive oil. 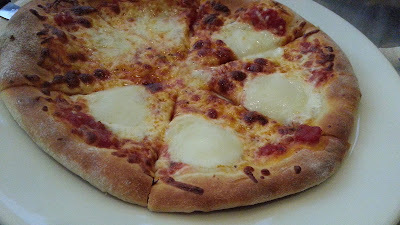 However, if you on the other hand want it up-front simple yet simply satisfying, I recommend the Untraditional Cheese. Isn't it obvious, the only topping is cheese and lots of it. I also loved the idea of putting a blob of fresh Mozzarella balls on top of the tomato sauce. Not in the photo is the good old Hawaiian. Regular diners have constantly asked why they don't have the variety, which the other franchises have, "the one with pineapple slices." But not a daunting task to compare CPK's new Hawaiian from the others, Aside from pineapples, it is also beautified with Canadian bacon, slivered scallions and Mozzarella atop their perfectly seasoned tomato sauce, not salty, not sweet, not even sour, just the right tang. 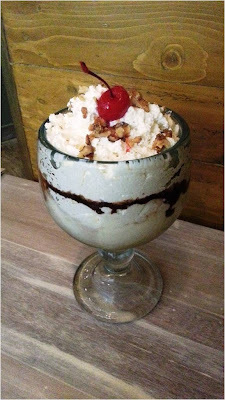 Need to make a quick mention of my refreshing bottomless glass of Peach Lemonade and the uber-huge stemmed glass of Turtle Sundae. Turtle Sundae is a layer of Vanilla Ice cream, choco fudge, caramelized walnuts, and tons of whipped cream, and of course a cherry on top. 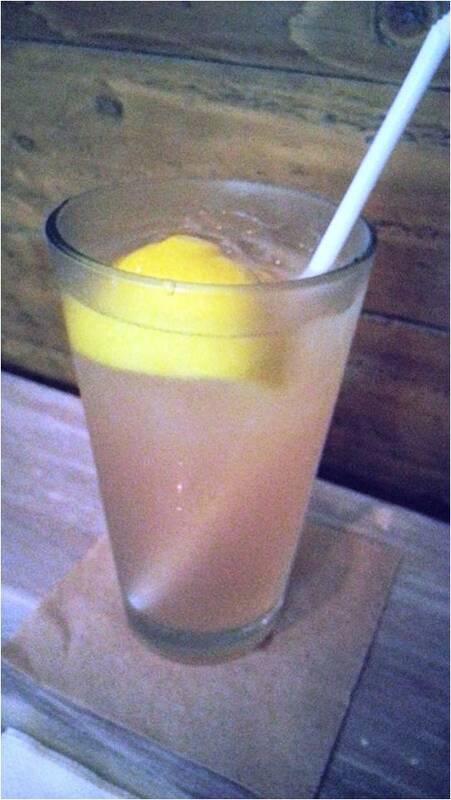 We all shared one glass, since it's really big, maybe good for three persons. However, I find the ice cream served less than the cream. This would be a total sweet-ending if served with more ice cream and choco-fudge. End note from the blogger: Sorry for the crappy photos, my DSLR broke, so I have no choice than to use my Samsung S3 phone for this, and also that explains why I'm not so visible in the event scenes. Anyhow, even without that palatable shots, I know that a lot of people would stand as witnesses as how CPK through out their 16 years manage being the pizza authority. Visit CPK in the following locations: Alabang Town Center, Shangri-La Plaza Mall, TriNoma, Greenhills Promenade, Power Plant Mall, Greenbelt 5, Lucky Chinatown Mall, Subic Harbor Point Mall, W Global Center Bonifacio Global City and Eastwood Mall. For latest news and updates, follow CPKPhilippines on Facebook and Twitter.